Cold Spring Harbor, NY — A team of neuroscientists and chemists from the U.S. and China today publish research suggesting that a class of currently used anti-cancer drugs, as well as several previously untested synthetic compounds, show effectiveness in reversing memory loss in two animal models of Alzheimer’s’ disease. Specifically, the research converged on what Zhong’s team suggests is a “preferred target” for treating memory loss associated with the amyloid-beta (Aβ) plaques seen in advanced Alzheimer’s patients. That target is the epidermal growth factor receptor, often called by its acronym, EGFR. Overexpression of the EGFR is a characteristic feature of certain cancers, notably a subset of lung cancers. Two targeted treatments, erlotinib (Tarceva) and gefitinib (Iressa), can dramatically, albeit transiently, reverse EGFR-positive cancers, by blocking the EGF receptor and thus preventing its activation. The newly published research by Zhong’s team suggests that the signaling within cells that is induced by EGFR activation also plays a role in the pathology—still poorly understood—involved in Aβ-associated memory loss seen in Alzheimer’s patients. Zhong and colleagues previously had studied Aβ-associated memory loss in fruit flies with brain cells expressing the Aβ-42 peptide (a specific version of the protein, composed of 42 amino acids, seen in Alzheimer’s plaques). These fruit flies are regarded as models of the illness in part because the Aβ-42 they manifest is encoded by a human gene, inserted in their genome. In behavioral experiments, such flies have been shown to suffer memory deficiencies analogous to those seen in human Alzheimer’s. In the current round of experiments, Zhong’s team demonstrated that enhanced activation of EGFRs in brain cells exacerbated memory loss in the Aβ-42 fruit fly model of Alzheimer’s disease. This led them to dose 3-day-old flies of this type with the two anti-cancer EGFR inhibitors over a week’s time, which was shown in behavioral tests on day 11 to prevent memory loss. 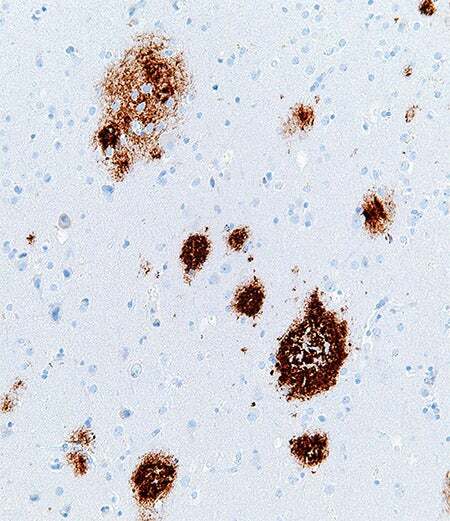 The results were then confirmed in mouse models of Alzheimer’s, also based on the human Aβ-42 gene. This was remarkable, but even more so, says Zhong, because of a parallel but independent experimental process that also suggested EGFR as a drug target for Alzheimer’s. This parallel process consisted of screening, by Zhong’s collaborators in China, of some 2,000 synthetic compounds for activity against Aβ-induced memory loss in model fruit flies. Of these, 45 compounds showed positive results in fruit flies after two months of dosing. Nine of these were selected for testing in mouse models, of which four showed positive results after two months. “We were amazed to find that three of these compounds—designated JKF-006, JKF-011 and JKF-027—not only showed effective results in rescuing memory loss in the mice, but also, in test-tube-based experiments prevented Aβ-42 from activating human EGFR,” Zhong reports. Importantly, a precise mechanism could not be conclusively demonstrated from this and related experiments. But the available evidence leads the scientists to propose in a paper appearing online today in Proceedings of the National Academy of Sciences, that reversal of memory loss occurs when clumps of beta-amyloid proteins are either prevented directly from “docking” with the human EGF receptor, or prevent phosphate groups from attaching to the receptor, a process called phosphorylation. Both hypothesized processes would prevent the initiation of the EGFR intracellular signaling cascade. Zhong and colleagues note the uncertainty of Alzheimer’s pathology. Memory loss stemming from Aβ-induced activation of EGFR “may reflect the acute toxic effects of Aβ, which might be independent of synaptic and neuronal degeneration,” they note. To gain more insight, the team tested drug treatment of middle-aged mice (8 months old) with advanced memory loss during an 18-day period—some six weeks shorter than the dosing period initially shown to be effective. “Eighteen days—the shortest dosing period we tested—was sufficient to reverse loss in these mice, although we should note that these animals had few morphological changes in the brain despite their severe memory loss when treatment began,” Zhong says. This work was supported by grants from Cold Spring Harbor Laboratory, Dart Neuroscience, the Ministry of Science and Technology of China, and the Tsinghua-Yue-Yuen Medical Sciences Fund.